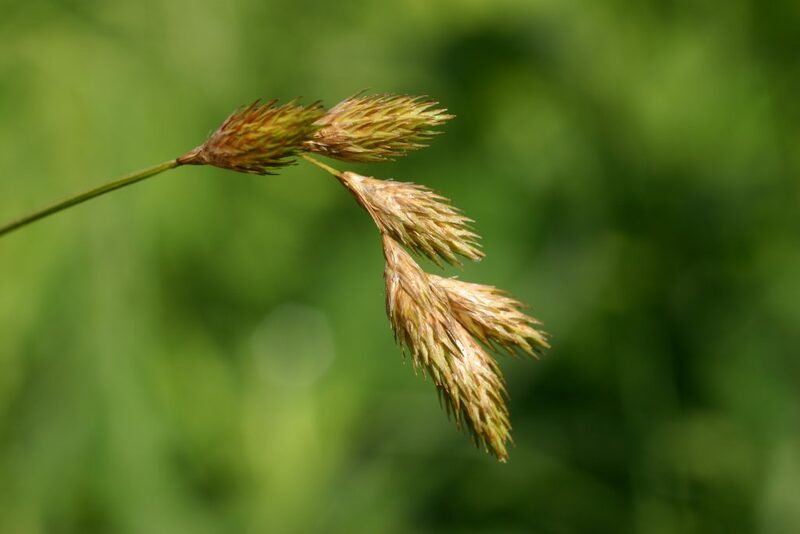 Carex scoparia. By Glen Mittelhauser. Copyright © 2015 Glen Mittelhauser.New England Wild flower Society.gobotany.newenglandwild.org (Accessed 4/2015). Carex scoparia is a perennial, densely tufted sedge, 20 cm to 1 m, stems 3-sided, rough near top, yellow-green, mature fruiting stems often prostrate; late season/winter stems elongate, leafy, leaves crowded toward top in 3 ranks (Gargiullo, personal observation). 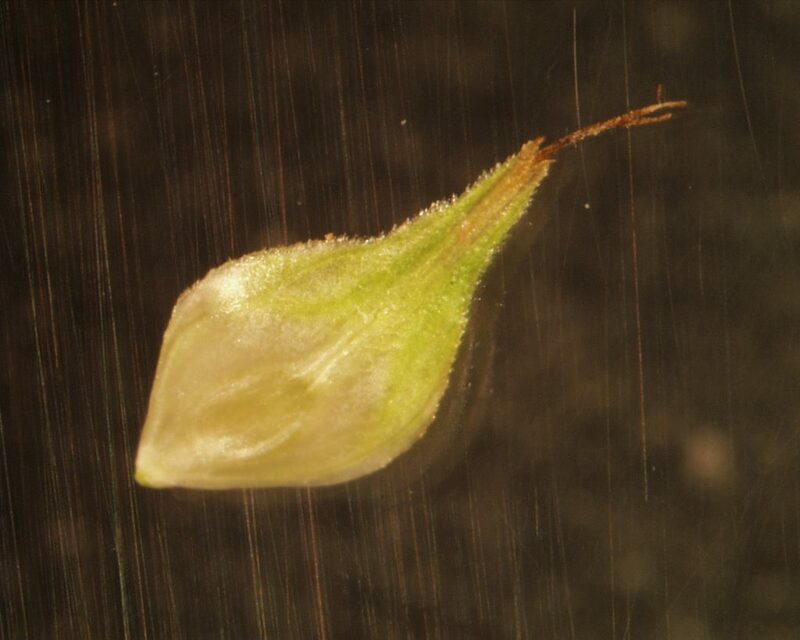 Leaves alternate, bladeless at base of stem, upper leaves shorter than flowering stems, sheath membranous on side opposite blade (ventral), veins with small cross branches (septate-nodulose). Flower spikes 3-8, stalkless, 0.8-1.4 cm long, clustered at top of stem but distinct, egg-shaped, pointed at both ends, tan to greenish, appearing finely bristly due to protruding fine tips of perigynia and scales, bract below each spike short, hair-like, inconspicuous; male flowers at base of most spikes; scale below each perigynium (female flower) brownish with pale margins, pointed, shorter and narrower than the perigynium; perigynia pale tan to brown, flat, longer than wide, 0.4-0.6 cm long, 0.1-0.2 cm wide, margins winged, very variable; blooms and fruits June-July. Carex scoparia var. scoparia_Perigynium ventral face – Walworth Co. WI.cyperaceae.e-monocot.org (Accessed 12/2024). 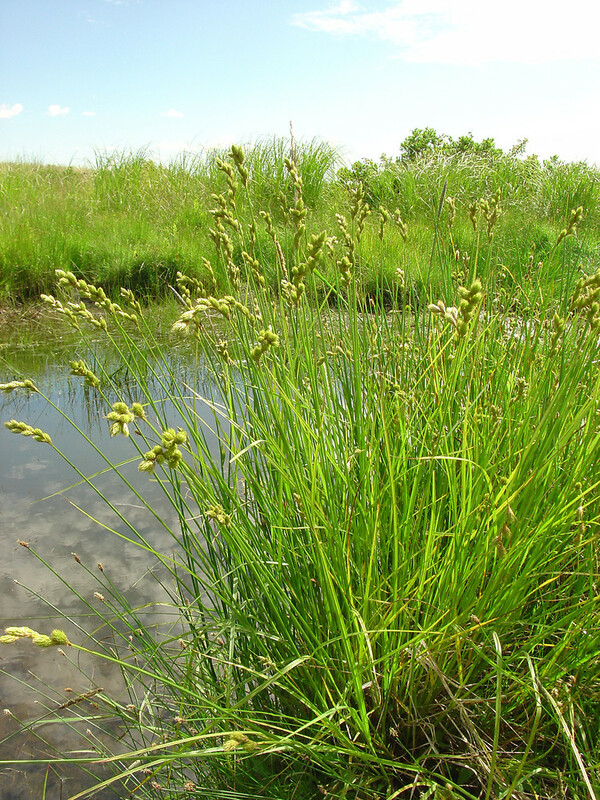 Habitat: Open swamp and pond edges, wet meadows, moist soil in open, upland habitats, soil pH 4.6-6.9, tolerant of anaerobic soils fire, and shade, intolerant of drought and salt (USDA, NRCS 2010). Notes: Appears to tolerate part shade of woodland edges. One of the more common sedges of moist to wet soil, apparently tolerant of some disturbance. Fed upon by sedge grasshoppers (Stethophyma spp. ), various leafhoppers especially Cosmotettix spp., aphids, pillbugs Sphenophorus spp., plant bugs and the caterpillars of some moths and skipper butterflies (Hilty 2006; Bartlett 2007).